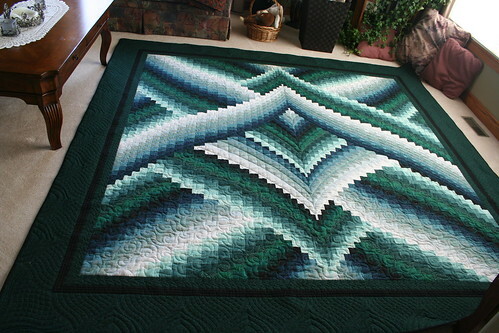 Both quilts are bargellos... "Lightning Strikes" is one of my favorite patterns. The first, the green one, was made for my son's wedding last January. One of my first attempts at custom, I sweat buckets over the thought, but in the end, I'm pleased with how it turned out. I used Ronda Byer's rulers for the border... first attempt with them. They are so easy to use. 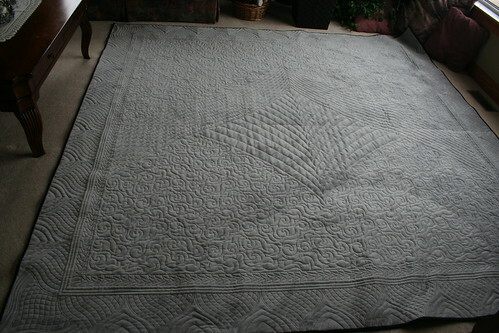 Quilter's dream wool, it's my new favorite batting), and a silver/grey minky on the back. Ok, now to try posting pictures, fingers crossed that it works. The second, oranges & browns, was for my daughter & son-in-law. She wanted the quilting to follow the lines of color. Was tons of rolling back & forth, I think it took longer than the first one. 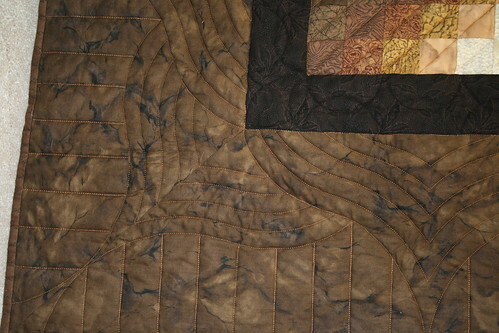 Again, Quilters dream wool, and brown minky on the back. Both are awesome! I love the s-shaped ruler. One of my fav's! WOW!!!! Both quilts are gorgeous! Lucky recipients!! You may only have completed two quilts last year but they are both amazing. Your quilting is beautiful. Congratulations on your soon to be sixth grandchild. Hi Sharon, it's sooooo good to see you! I've often wondered what you were up to, thinking you must be super busy -- but wow all those wonderful grand babies and another on the way! How great is that! Congratulations! Love these quilts and what you've done with them. So beautiful! 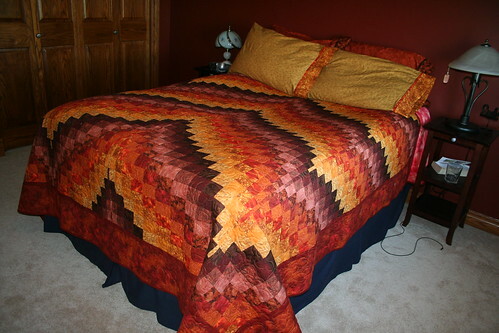 Both quilts are gorgeous Sharon! So nice to see you posting again and that your keeping busy with grandkids! I'm going to have to look into this ruler you used for your borders, I love the design! Wow Sharon, they are both gorgeous! ......and huge!! The borders are really beautiful. Love the Minkee backs too Enjoy all those wonderful grandkids. 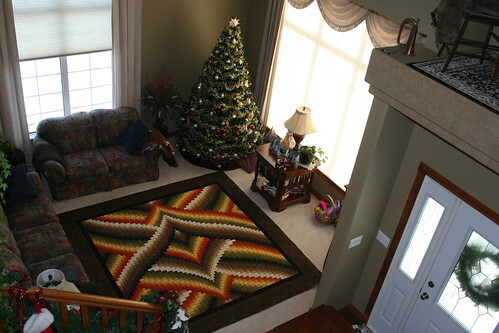 Gorgeous quilts and quilting, Sharon! 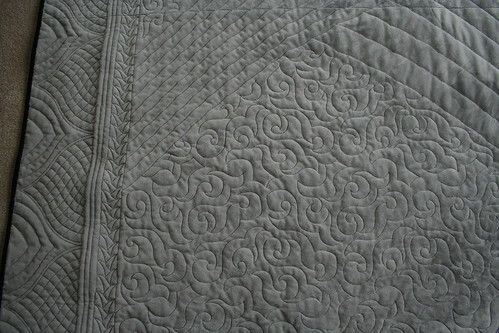 I love that you chose Minkee backs...it shows off your quilting so beautifully! 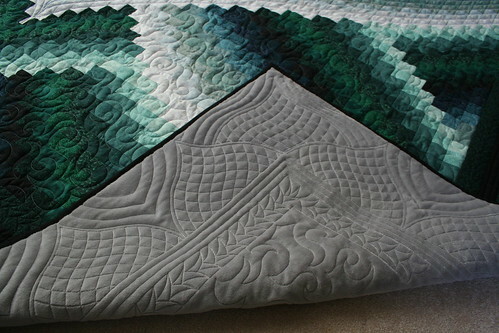 These are both beautiful quilts and the quilting is wonderful. I saved them both for inspiration. Serendipity: The discovery of something wonderful quite by accident while looking for something quite different. I've always wanted to do a bargello and now after seeing these beautiful quilts with the stunning designs, I should start mine soon. Love them both and your quilting is awesome ! "ONLY" two quilts ???? BUT both Bargello! WOW...........that's a feat in itself. I have ONE bargello on my Winter To Do List and haven't even started yet. I do have the fabric ! Wow, Sharon! These are both knock-outs!! The quilting is fabulous! Looks like you have mastered Rhonda's Rulers!! Well done! Both of them are Awesome! I can't imagine the time it takes piecing one of those together no less the fabulous job you did quilting them. AWESOME!! Those are out of the park beautiful love love love your quilting. I've got to look into those rulers too. Great job! 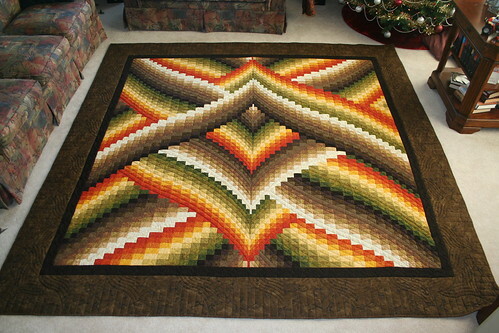 I've never really cared for Bargello quilts, BUT after seeing your orange & brown one (so very beautiful!) I think I need to look up a pattern and see how difficult these are to make. I don't think I have ever even read a pattern on them. Are they very difficult? Are some easier than others? Yours are truly awesome quilts!! Fabulous!!!!!!! Love both. I think they got a two for one. I bet the backs are fabulous too!!!!! Both are gorgeous, Sharon! I love your quilting in the borders. Oh my, thank you all so much for the wonderful comments! I actually feel like a real quilter now! They are the greatest compliments I could have, and it feels good to give a little something back after all the great advice and inspiration I find here. This is an amazing place. I would be so lost without this forum. Oma, your comment about your grandkids all graduating in succession made my eyes bug out! I hadn’t thought that far ahead yet! LOL Do they each get a quilt for their grad, and how do you keep up with making them all in time? At the rate I’m going, I better start now! Linda, hi back! Good to see you too! We’re practically neighbors, would love to meet you some day. I’m always looking for posts from my fellow Canucks on here, (Hi Cathy!) and wishing I didn’t live quite so far from you all. Both quilts are just simply beautiful! really lovely s curve cross hatching in your borders it look great. you have done a really good job there. great to see your quilts, thanks for picking up my challenge! And they are very fine quilts indeed! 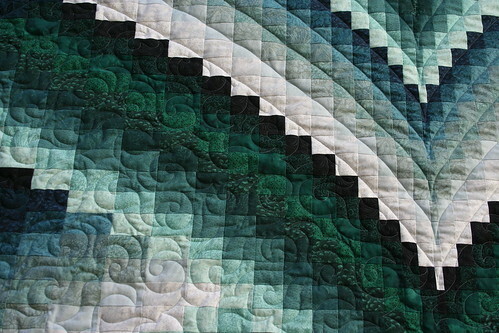 Course Bargello is one of my favs....love the curved cross hatching! APQS Millenium, Circle Lord equipped, hand guided and lov'n it!!! Quilting From the Heart is on Facebook! 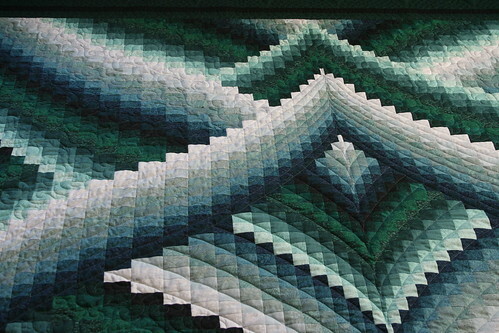 RoseCity Quilter is also on Facebook!! Oh my goodness! These are both beyond stunning and beautiful. I love your border treatment with Rhonda's rulers. 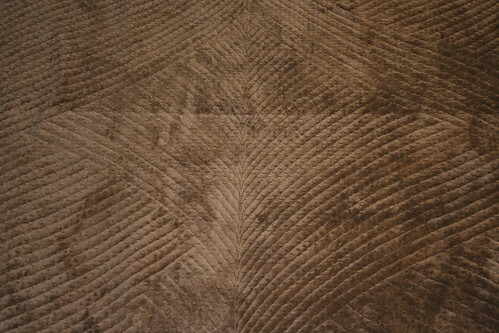 I have a quilt to use them on and after seeing your treatment I am anxious to get started on it. "Live every day, like you were dieing"